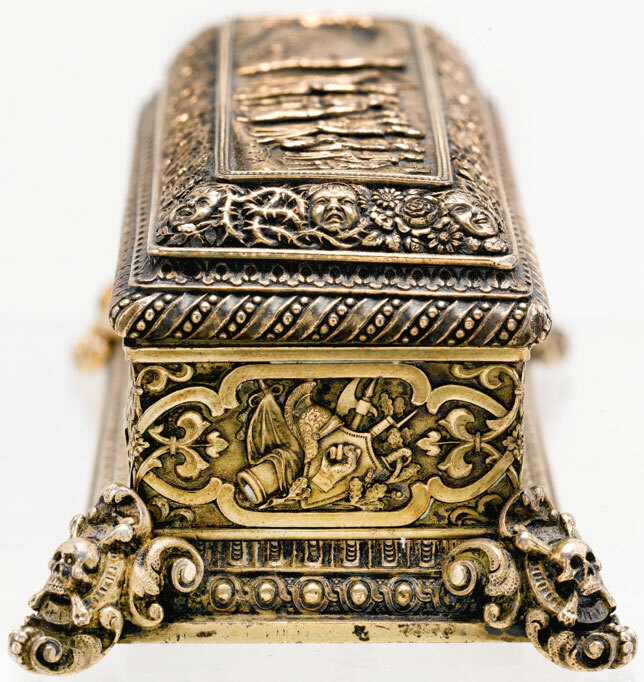 This fantastic piece is up for sale as Lot 291 in Sotheby's "A Treasured Legacy: The Michael and Judy Steinhardt Judaica Collection"auction coming up on April 29, 2013. Who would like to purchase it for The Morbid Anatomy Library? 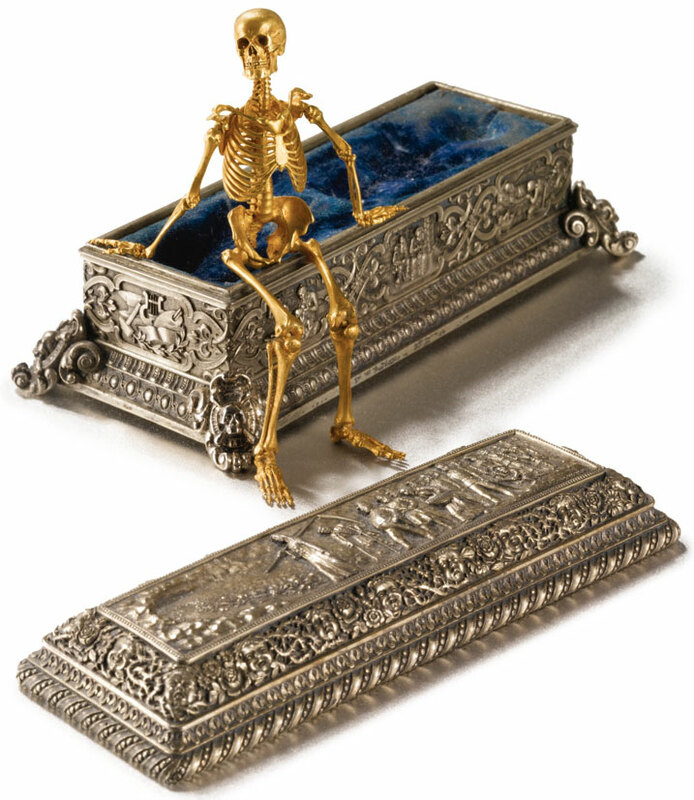 The fully articulated human skeleton in a velvet-lined coffin chased around on each side with three panels showing the course of life, one end with attributes of the arts, the other with attributes of war, the removable cover with the journey in the footsteps of the Angel of Death, surrounded by the faces of infants alternately laughing and crying. Skeleton signed in Cyrillic, on the right splint-bone: Mozyr 92 Odessa 96 and on the left splint-bone Rouchomovsky. Sarcophagus signed on lid: Israel Rouchomovsky and in Cyrillic on base Israel Rouchomovsky Odessa 1901.
length of skeleton 3 1/2 in., length of coffin 4 3/8 in. Israel Rouchomovsky (1860-1934) came from a poor family in Mozyr, Belarus. Almost three-quarters of the population of the town was Jewish, and according to some accounts his parents wanted him to become a rabbi. [i] His memoirs describe how he was drawn to silversmithing, and the efforts required to get a work permit and move with his family to Odessa, where he arrived in 1892. They also recount how he helped a colleague make a first gold skeleton, now held in the Museum of Historical Treasures of the Ukraine. [ii] He had thought this first skeleton would require a month of work, when in fact it took four, and he thought he could do even better; only certain sections of the first skeleton could move. The inscription on the leg shows that the fully articulated skeleton – supposedly with 167 different parts[iii] – required five years of work. You can find out more--and put a bid!--by clicking here. Thanks so much to friend and excellent artist Martin Bland for bringing this wonderful piece to my attention! Click on image to see larger, more detailed images. Oh, to own this would be life-changing! Imagine seeing & touching this beauty every day.